Gained six years of experience as an associate at a private practice in Addison, NY, before moving to the Buffalo region and proudly joining Stellar Dental Care. While living in the Southern Tier, I also gave back to the community where I grew up by serving as a volunteer dentist for Health Ministries of the Southern Tier where I was nominated to the Board of Directors. Have extensive training and experience with CEREC “single visit dentistry”, utilizing the latest CAD/CAM technology to fabricate ceramic crowns using digital impressions and immediate fabrication, eliminating the need for traditional impressions, temporary crowns, and a follow-up visit. In my spare time, enjoy time spent with my husband, Dan, and two sons exploring the Buffalo Niagara Region. Born in Lewiston, New York, I grew-up in Niagara Falls and graduated in 1984 from Niagara Falls High School, where I was co-captain of the swim team. Later, I swam for Syracuse University. I’ve played bass guitar in a band along the way, and like tinkering with computers, radios, scanners, and other gadgets. I’m a proud owner of a Meade LX200 10″ SCT telescope, build mid-power rockets, and fly RC aircraft when weather permits. I have a beautiful wife and two fantastic children who gracefully tolerate my interests. My advanced training was based at The Buffalo General Hospital Dental Department, now part of the Kaleida Health Care System. There I sharpened my skills in the practice of general dentistry, including rounds in the Emergency Oral Surgery clinic, and Emergency Room on-call. Additionally, my residency included work at the Deaconess Skilled Nursing Facility dental clinic, located in Buffalo, NY. All phases of general dentistry were provided, as well as treatment of geriatric and mentally-disabled patients. I’ve also served the Tuscarora Native-American community as their dentist in the bustling Tuscarora Reservation Dental Clinic. This facility is located in the Tuscarora School complex, 2015 Mount Hope Road, Lewiston, NY. I have treated thousands of adults and children of all ages at this clinic, and continue to do so on a part-time basis. I’m now associated with Stellar Dental Care to assist you in maintaining proper oral health and prevention of tooth decay. We look forward to serving you! 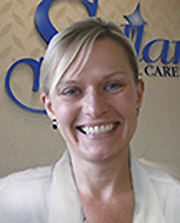 Dr. “Diane” comes to Stellar Dental care with a solid background in general and cosmetic dentistrty with 14+ years of experience. Her mastery of skills and knowledge in clinical procedures in the fields of restorative dentistry, fixed and removable prosthodontics, endodontics, oral surgery, Invisalign and mini-dental implants. She is a highly skilled, organized analytical professional with strong leadership and communication skills. We’re proud to have her on our team. Julia Kagan, D.D.S. practices as an Acupuncturist in Buffalo, NY.She graduated from SUNY at Buffalo, School of Fine Arts , SUNY at Buffalo, School of Dental Medicine . Dr. Julia Kagan is proud to offer caring, integrative treatment for individuals suffering with TMJ and Sleep Apnea disorders. She is a practicing general dentist of 11 years and a certified acupuncturist focusing on imbalances of the jaw and troubleshooting for other concurrent issues that commonly arise. She looks forward to helping you reclaim your vitality through a holistic mindset. After earning his Bachelors Degree in Dentistry in 2001 from the Faculty of Dentistry, Cairo University, Dr. El-Halaby practiced as a general dentist for about five years. During that time, his interest in the field of implantology drew him to pursue an advanced education in periodontics. In 2006 Dr. El-Halaby started residency at the Periodontics program at Case Western Reserve University, under the mentorship of Dr. Nabil Bissada. This dual-degree program awarded him with a Masters Degree in Oral Sciences, and a Certificate in Periodontics. During residency, Dr. El-Halaby worked on a research project investigating the relationship between failed hip and knee joints and oral periodontal health, in addition to bacterial plaque and synovial fluid bacterial DNA compositions. This resulted in a publication in the Journal of Clinical Rheumatology in the April 2012 issue, and was Dr. El-Halaby’s masters thesis project. Other publications by Dr El-Halaby as primary author were related to clinical and surgical topics, and were published in the International Journal of Periodontics and Restorative Dentistry, and the Texas Dental Journal. In 2011, Dr El-Halaby founded the East Texas Dental Hygiene Study Club, which provides the dental community with continuing education credits (CE’s) in the format of regular seminars discussing current and future trends in the field. 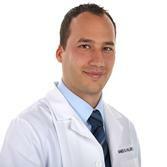 We are pleased that Dr. El-Halaby is now a valued member of our staff at Stellar Dental Care.